The little brown bat, once the most populous bat species in the eastern U.S., is now a rare sight. Photo by U.S. Fish and Wildlife Service. This week the U.S. Forest Service is participating in the celebration of Bat Week, an international effort to bring attention to the role of bats in nature and the threats they face across the world. Bats play essential roles in the health of both the environment and the economy, pollinating plants, dispersing seeds – and literally consuming tons of insects. In the U.S. alone, bats save billions of dollars in pest control each year by eating insects that damage agricultural crops. In North America, bats face unprecedented risks from continuing and emerging threats that include habitat loss and fragmentation, wind energy development, climate change, and white-nose syndrome. White-nose syndrome — named for the white fungus that covers the muzzles and other parts of bats while they hibernate — has killed millions of bats since it was first detected in 2006. Well over a million bats have been killed at wind energy facilities since 2000. The continuing spread of white-nose syndrome, increasing wind energy developments across the continent, and intensified land use changes have pressed the need for some way to estimate the populations of bat species across the North American continent. Earlier this year, the Forest Service Southern Research Station (SRS) published A Plan for the North American Bat Monitoring Program (NABat), which provides detailed guidelines for participating in NABat, an international multiagency program created to provide the data needed to make effective decisions about bat populations across the North American continent. 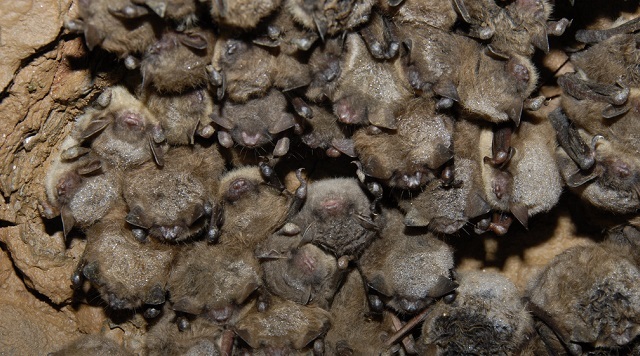 Susan Loeb, SRS research ecologist, served as lead author on the publication, which represents the first step in establishing the NABat monitoring program for North American bats. The goal of NABat is to provide natural resource managers the information they need to manage bat populations effectively, detect early warning signs of population declines, and estimate extinction risks. Though well-developed monitoring programs are in place for birds and other animals, until now there hasn’t been a similar program to monitor bats in North America. The NABat plan provides the details needed for interested groups, agencies, and the public to start monitoring and contributing data to a centralized database. As data accumulates, NABat will provide statistical analyses of status and trends in bat populations at national and regional scales. Once several years of consecutive data have been collected, NABat will issue periodic reports on trends in abundance and distributions of bats across North America. Periodic detailed reports focused on individual species of specific concern will also be produced. In addition to Loeb, co-authors on the report include scientists from the National Park Service, U.S. Geological Survey, U.S. Fish and Wildlife Service, Canadian Wildlife Service, Wildlife Conservation Society-Canada, National Institute for Mathematical and Biological Synthesis, and Bat Conservation International. For more information, email Susan Loeb at sloeb@fs.fed.us.